Tucked away on the left-front side of the Nikon D3400 camera, just under the Flash button, the Function (Fn) button is set by default to provide quick access to the ISO Sensitivity setting. By holding down the button and rotating the Command dial, you can adjust the setting without going through the Shooting menu or Information or Live View control strips. But if you don’t adjust the ISO setting often, you may want to assign one of three other possible functions to the button. Establish the button’s behavior via the Buttons option on the Setup menu, shown on the left. After selecting Buttons, press OK to display the screen on the right in the figure and choose Assign Fn Button. Press the Multi Selector right to display a list of button functions, as shown here. 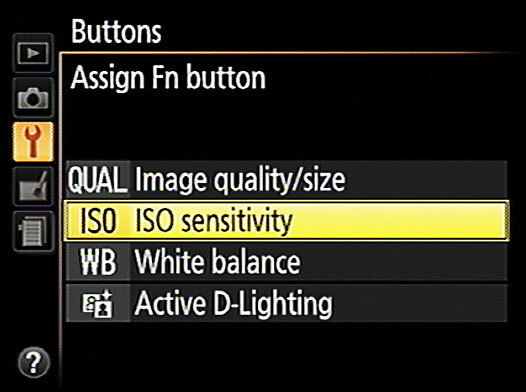 The default option enables you to use the Function button to access the ISO Sensitivity option quickly. Image Quality/Size: Pressing the Fn button while rotating the Command dial cycles through all the possible combinations of the Image Quality and Image Size settings. ISO Sensitivity: Choose this option to return to the default setting. Again, when this option is selected, pressing the Fn button while turning the Command dial changes the ISO setting. White Balance: Pressing the Fn button while turning the Command dial changes the White Balance setting, but only in P, S, A, and M exposure modes. Active-D Lighting: Pressing the Fn button while turning the Command dial toggles Active D-Lighting on and off. Like the White Balance option, this one is adjustable only in the P, S, A, and M exposure modes. After selecting the button function you want to assign, press OK.